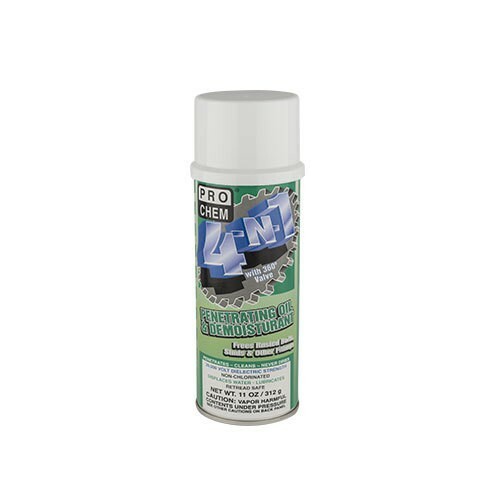 4-N-1 | Pro Chem, Inc.
4-N-1 is a high dielectric spray that protects against industrial and atmospheric pollution, dust, abrasive matter and chemical fumes. It forms a non-drying, invisible film that prevents moisture-induced deterioration and malfunctions on motors, transformers, switches, relays, timers, fuses, circuit breakers, ignition systems, capacitors, rheostats and other electrical components and circuitry without any loss in conductivity. It creeps along surfaces and into cracks to lubricate, prevent rust, and loosen frozen parts. It leaves a water-displacing shield and a lubricating film to make anything run smoother. 4-N-1 can also be used on injection molds and dies. Use as a flushing agent when introducing new greases to bearings and gear boxes. This product is suitable for use as a lubricant where there is no possibility of food contact in food processing and food handling establishments. To remove corrosion: Spray liberally directly on to dirt and scale. Allow to penetrate. Remove loosened scale, then reapply to leave an anticorrosive coating. To displace moisture: Spray electrical equipment until thoroughly saturated. Allow to penetrate before attempting to restart, then re-apply. To loosen frozen nuts and bolts: Apply liberally to frozen nuts and bolts, hinges and sliding and rotating parts. Allow to penetrate into threads. Work parts back and forth, the reapply to leave a never-dry, protective lubricating film.